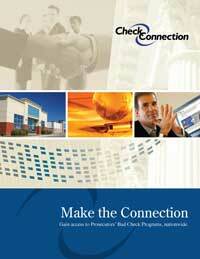 Merchants' Perspective Bad check recovery made easy through District Attorneys’ Programs. With recovery rates that often top 60%, prosecutors’ programs are unquestionably the most effective method for recovering bad checks. In addition, prosecutors return 100% of what they recover. But how can you take advantage of this extraordinary resource? Dealing with a multitude of prosecutors, when every program is different, is a logistical nightmare. The solution is Check Connection. Check Connection takes care of all communication, compliance, accounting and reporting. You simply transmit your checks to Check Connection and we take it from there. I'm a Prosecutor. What do I do?